Explore Lancaster Heights real estate in Boise, ID. 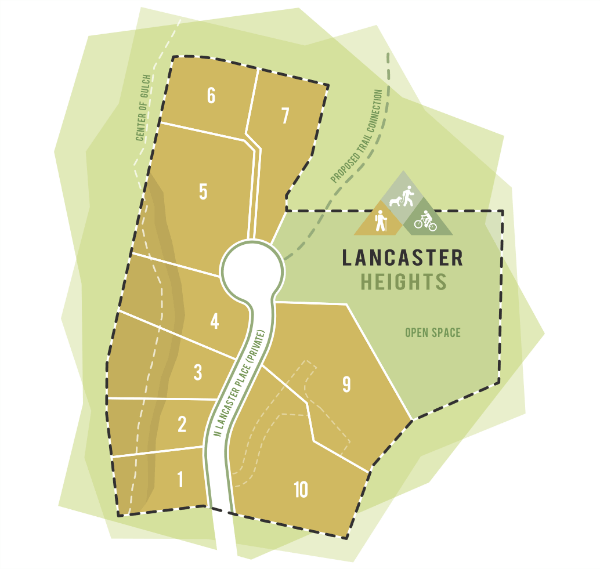 Lancaster Heights is perfectly nestled in desirable North Boise. Surrounded by phenomenal city and foothill views this community offers just nine premier sites to build your new custom home. Take in the beauty of this lower foothills setting on your private outdoor patio, in the neighborhood open space or take a hike on Hillside to Hollow trail system. With quick access to downtown Boise and Hyde Park, this superb location lets you truly experience the best the North End has to offer. View Boise properties for sale below or learn more about Lancaster Heights real estate. Looking for newly constructed homes? Search our vast selection of new homes in Boise or browse our complete guide to new Boise subdivisions. 9 building lots, covering 8.32 acres, ranging in size from 0.34 acres (14,810 Sq. Ft.) up to 0.96 acres (41,818 Sq. Ft.). From Harrison Blvd head West on Hill Rd. Turn right (north) on Lancaster Dr, Boise, ID 83702. Only 9 new homes will be built in Lancaster Heights. For the best selection of homesites - do not delay, contact us online or call our Boise New Home Specialists at (208) 391-4466.